The initial efforts to upgrade the educational system in Vilcabamba have not only been successful, but have already yielded great results. In early 2003, CK Companies CEO and Founder, Craig Keeland, visited the school with Dr. Mark Pederson, to personally deliver the first donated computer to the school. A second computer along with additional materials were sent to Vilcabamba. In October, 2003, Craig Keeland, overseen the packaging of an entire palette of materials gathered by the son of Dr. Mark Pederson who solicited the donations of these items as a part of his Eagle Scout Project. All freight costs and administrative expenses for this and all other donations have been paid by Craig Keeland personally. The future of the children of San Pedro is now. 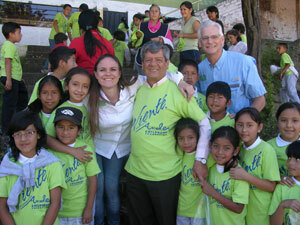 We must continue providing help to these children so that their future is brighter. With recent donations and Mission Trips to Vilcabamba, ACF has been able to deliver 1000’s of dollars worth of equipment and provide much needed school supplies and new desks and chairs.